The responsible agent for brucellosis is a gram-negative, asporous, immobile, small coccobacillus bacteria. They reproduce easily in wet and humid environments, and they can live for a long time in raw milk and dairy products. They are inactivated by boiling and pasteurization . Disease primarily exists in animals and generally transmits to humans by consumption of non-pasteurized milk and dairy products, direct contact of secretions of infected animals with disintegrated skin, inhalation of aerosols or inoculation to conjunctiva . It can be seen almost everywhere and ages all over the world, particularly in Mediterranean and Middle East countries . Brucellosis is reported endemically in our country. Seropositivity for brucellosis is about 2%-8% in healthy population, whereas this rate ranges between 2%-25% in risk groups . Linezolid is a synthetic molecule and a member of oxazolidinone family, which exerts its effects by binding to 50 S ribosomal subunits and by inhibiting protein synthesis . It has good efficiency particularly against methicillin-resistant staphylococcus and vancomycin-resistant enterococcus, and also other gram-positive pathogens including penicillinresistant pneumococcus, and macrolide-resistant streptococcus [6,7]. Linezolid is indicated for dermal and soft tissue infections, lower respiratory tract infections, and vancomycinresistant enterococcus infections. It is effective against atypical respiratory pathogens (Legionella pneumophilia, Mycoplasma pneumonia and Chlamydia pneumonia). Linezolid also has in-vitro efficiency against Neisseria gonorrhoea and Neisseria meningitides, but its effectiveness is limited against Haemophilus influenza . It is ineffective against gramnegative bacillus because of the efflux pump of the bacteria. It is effective against gram-positive anaerobic, but has limited effectiveness against Bacteriodes fragilis . It exerts well in vitro activity against Mycobacterium tuberculosis and Mycobacterium avium complex and rapidly growing mycobacteria [9,10]. It has excellent in-vitro activity against Nocardia . Brucellosis treatment has a long duration, and two of Streptomycin, Doxycycline and Rifampicin are the most frequently used antibiotics. Nevertheless, relapse rates were reported about 20.4%-22.6% in previous studies . As a consequence, studies are conducted about alternative treatments for brucellosis. In this study, we have evaluated the in vitro efficiency of linezolid against Brucella melitensis. Anaerobic blood culture bottle sample (BD Bactec plus Aerobic Culture Vials) of patients were kept in blood culture incubation equipment (BD Bactec FX). Following a positivity alarm for the sample, passages have been done to 5% sheep blood agar (SBA) and Eosin Methylene Blue (EMB) agar mediums, and kept in bacteriologic incubator by controlling for growth at 37°C for 48 h. At the end of 48th hour, when adequate growth is observed, gram staining revealed gramnegative coccobacillus (Brucella spp.). Moreover, agglutination with Brucella polyvalent antiserum was detected serologically, and 20 strains were directly taken under examination. Bacteria colonies taken from culture environment by disc diffusion method were diluted until 0.5 McFarland level, and cultured to 5% Sheep Blood Agar (SBA) medium. Linezolid (LNZ) 30 μg (Bio-analyse) antibiotic discs were put to cultures. Samples were kept in bacteriologic incubator by controlling for growth at 37°C and approximately for 48 h. Then, inhibition zone was measured around Linezolid (LNZ) 30 μg (Bio-analyse) antibiotic discs. In E-Test method, bacteria suspension was prepared with samples, which were taken from same bacterial colonies until 0.5 Mc Farland level and cultured. Then, Linezolid E-Test strip (Bioanalyse MIC Test Strips, 0.016-256 μg) was located, and kept in bacteriological incubator for 48 h and the values were recorded. Finally, according to the values recorded in disc diffusion method and measurements with millimetric ruler, inhibition zones around Linezolid (LNZ) 30 μg antibiotic discs of 20 Brucella melitensis strains were found to be ≥ 25 mm (Figure 1). Figure 1: Disc diffusion measurements for Brucella melitensis strains. The evaluations in E-test method revealed that MIC values were 1.5 μg in 11 strains, 2 μg in 3 strains, 4 μg in 4 strains, and 6 μg in 2 strains (Table 1 and Figure 2). 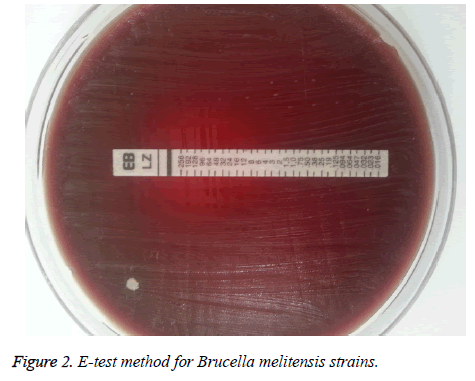 Figure 2: E-test method for Brucella melitensis strains. Table 1. Linezolid E-test MIC values. Agents for the treatment of the zoonosis of brucellosis include antimicrobial agents like doxycycline, rifampicin, ciprofloxacin, tetracycline, and streptomycin. Nevertheless, best treatment regimen has not been defined exactly. Complete eradication of the microorganism is difficult, and recurrences are frequent . Therefore, the ideal step in the treatment of brucellosis is to take steps to minimize treatment failure and to relapse the rate . 19 isolates of the Brucella isolates obtained from 82 blood cultures were found to be susceptible to rifampicin with the E-test method . Kaya et al. reported that streptomycin had high MIC values by broth micro dilution method in Brucella species isolated from blood samples of 34 suspected brucellosis patients . Altun et al. reported that three isolates on a total of 96 strains of Brucella spp. isolated from blood and bone marrow cultures were resistant to TMP/SMX, tetracycline and streptomycin using by E-test method . For this reason, studies conducted with drugs that are different from the classical treatments, which are already being used for Brucella management. Denk et al. evaluated the in vitro sensitivities of classical antibiotics, and quinolones and macrolides, and found that especially azithromycin was sensitive among quinolones and macrolides, and recommended its use in combination treatment . Other antibiotics were also studied for brucellosis treatment, and antibiotic sensitivity tests of tigecycline for Brucella bacteria were conducted. E-test methods revealed that tigecycline had in vitro efficiency on Brucella, and it was recommended as an alternative treatment method [18-20]. Linezolid, which is generally used for grampositive bacterial infections, was found to be effective on Brucella in in vitro analyses in our study. It was reported that Linezolid had excellent in-vitro activity against all gram-positive bacteria [5,6]. MIC values ≤ 2 mg/L for Streptococcus pneumonia and enterococcus were considered to be sensitive . Additionally, effects of Linezolid on some microorganisms other than gram-positives were also evaluated, and it was found to have limited activity against Haemophilus influenza (MIC: 4-16 mg/L) . The studies on mycobacteria revealed that Linezolid had moderate potent anti-tuberculosis activity in both drugsensitive and drug-resistant disease [9,10]. For decreasing the toxic effects with long-term use, daily dose of the antibiotic was decreased . Additional studies have been conducted on especially nocardia infections that seen in immunosuppressed patients. Linezolid was suggested to be an alternative to cotrimaxazole in the treatment of nocardiosis and its empirical use was suggested for particularly the nocardiosis treatment in organ transplanted patients [1,22]. Linezolid was also used for treatment of nocardia peritonitis due to peritoneal dialysis . In our study, MIC value of Linezolid for Brucella melitensis was found to be 1.5-6 μg and it was thought to be effective in the treatment of brucellosis. Brucella is common in some parts of the world. Brucellosis has a prognosis with recurrences and relapses, and its treatment is prolonged and difficult especially when it is complicated with spondylodiscitis or neurobrucellosis. Resistance to classical antibiotics began to increase in Brucella treatment. Eventually, alternative treatments (mainly tigecycles) with other antibiotics were examined. Mycobacteria revealed that Linezolid had moderate potent anti-tuberculosis activity in both drugsensitive and drug-resistant disease. In our study, Linezolid was found to be effective in vitro against Brucella melitensis, this study provide new approach for brucellosis treatment especially resistant species and complicated brucellosis. Alptekin N, Bilgic A. Brusellozis. Turkiye Klinikleri Fiziksel Tıp ve Rehabilitasyon Dergisi 2003; 3: 97-105. Yuce A, Alp-Cavus S. Turkiye’de bruselloz: genel bakis. Klimik Derg 2006; 19: 87-97. Alkan BM, Calap B. Brusella’da kas-iskelet sistemi bulgulari. Fiziksel Tip 2004; 7: 99-104. Gunes T, Alim A, Kaya S, Poyraz O. Seroprevalence of brucellosis in high-risk groups in central Anatolia. Cumhuriyet Tip Derg 2009; 31: 112-115. Kucukbayrak A, Ozdemir D. Two new protein synthesis inhibitors: Linezolid and streptogramins (quinupristin/dalfoprustin). Turkish J Infect 2006; 20: 145-151. Diekema DI, Jones RN. Oxazolidinones: a review. Drugs 2000; 59: 7-16. Moellering RC. Linezolid: the first oxazolidinone antimicrobial. Ann Intern Med 2003; 138: 135-142. Zurenko GE, Yagi BH, Schaadt RD. In vitro activities of U-100592 and U-100766, novel oxazolidinone antibacterial agents. Antimicrob Agents Chemother 1996; 40: 839-845. Alcala L, Ruiz-Serrano MJ, Perez-Fernandez TC, Garcia De VD, Diaz-Infantes M, Marin-AM, Bouza E. In vitro activities of linezolid against clinical isolates of Mycobacterium tuberculosis that are susceptible or resistant to first-line antituberculous drugs. Antimicrob Agents Chemother 2003; 47: 416-417. Fortun J, Martin-DP, Navas E, Perez-Elias MJ, Cobo J, Tato M, De la Pedrosa EG, Gomez-ME, Moreno S. Linezolid for the treatment of multidrug-resistant tuberculosis. J Antimicrob Chemother 2005; 56: 180-185. Jodlowski TZ, Melnychuk I, Conry J. Linezolid for the treatment of nocardia spp. Infections Ann Pharmacother 2007; 41: 1694-1699. Hasanaina A, Mahdy R, Mohamed A, Ali M. A randomized, comparative study of dual therapy (doxycycline-rifampin) vs. triple therapy (doxycycline-rifampin-levofloxacin) for treating acute/subacute brucellosis. Braz J Infect Dis 2016; 20: 250-254. Akova M, Uzun O, Akalin HE, Hayran M, Unal S, Gur D. Quinolones in treatment of human brucellosis: comparative trial of ofloxacin-rifampin vs. doxycycline-rifampin. Antimicrob Agents Chemother 1993; 37: 1831-1834. Cevik MA. Bruselloz epidemiyolojisi. Ankem Derg 2003; 15: 568-570. Turan H, Arslan H, Uncu H, Azap O, Serefhanoglu K. Tigesiklinin Brucella suslarina in vıtro etkinliginin doksisiklin, siprofloksasin ve rifampisinin etkinligi ile karsilastirilmasi. Turkish J Infect 2007; 21: 147-151. Kaya O, Akcam, FZ, Yayli G. Investigation of the in vitro activities of various antibiotics against Brucella melitensis strains. Turk J Med Sci 2012; 42: 145-148. Altun B, Hascelik G, Gur D. In Vitro activity of tigecycline against Brucella spp. Trakya Univ Tip Fak Derg 2009; 26: 261-263. Denk A, Demirdag K, Kalkan A, Ozden M, Cetinkaya B, Kilic SS. In vitro activity of Brucella melitensis isolates to various antimicrobials in Turkey. Infect Dis 2015; 47: 364-369. Kilic S, Dizbay M, Cabadak H. In vitro activity of tigecycline, tetracycline and fluoroquinolones against Brucella melitensis. J Chemother 2008; 20: 33-37. Altun B, Hascelik B, Gur D. In vitro activity of tigecycline against Brucella spp. Trakya Univ Tip Fak Derg 2009; 26: 261-263. Johani SA. In vitro activities of tigecycline against Brucella spp. in an endemic area. Afr J Microbiol Res 2014; 8: 1837-1840. Park N, Hong SB, Oh YM, Kim MN, Lim CM, Lee SD, Koh Y, Kim WS, Kim DS, Kim WD, Shim TS. Efficacy and tolerability of daily-half dose linezolid in patients with intractable multidrug-resistant tuberculosis. J Antimicrob Chemother 2006; 58: 701-704. De La Cruz O, Minces LR, Silveira FP. Experience with linezolid for the treatment of nocardiosis in organ transplant recipients. J Infect 2015; 70: 44-51.